The most unique and obvious physical characteristic of hedgehogs is their quills. Most breeders and enthusiasts alternate between using “spines” and “quills” which is often confusing. Hedgehogs technically have quills, which are modified hairs that form a spine. All quills are spines but not all spines are quills. For example, a lizard can have spines but they are not made out of hair. Instead, they are made out of scales. Hedgehogs cannot shoot quills or detached quills by shaking or huffing their bodies. They do NOT have barbs on the end, as do porcupine quills that can stick in your skin. Hedgehogs use their spines as their main line of defense by erecting them so they crisscross and point in different directions protecting the skin and body. Hedgehogs have an orbicularis muscle, that it contracts like a drawstring, when it rolled into a ball. The hedgehog hides it’s head and legs by creating a ball and using it’s spines as protection. Hedgehogs can puff and pop. If an individual spine pokes you it can be painful. 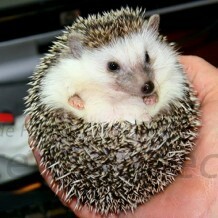 Proper handling techniques allow the hedgehog to become relaxed and handled comfortably. It’s spines will lie flat, toward the tail, when relaxed and the spines will feel relatively smooth, when petted from front to back. Hedgehogs have soft, white fur on their face and bellies. They typically keep their fur clean and neat. A healthy hedgehog should have no mats or caking of its fur.